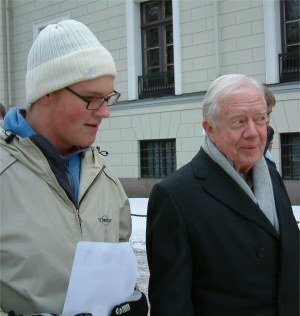 On our first day in Oslo we had a dream: To meet and perhaps make an interview with the Nobel Peace Prize winner, former President of the United States of America, Jimmy Carter. An actually… our dream came through..
Just minutes after Jimmy Carter and his family members arrived at Grand Hotel they were out in the streets of Oslo. They walked Karl Johan, the main street of Oslo, passed the Royal Castle and ended up at the famous Statue Park – Vigelandsparken. Our students walked along with the very friendly and happy Peace Prize winner and was able to take pictures and make an exclusive interview..